Summary: Molly Murphy, now Molly Sullivan, and her husband, Daniel, a captain in the New York Police Department, have been invited to spend their honeymoon on the Newport, Rhode Island, estate of Alderman Brian Hannan in the spring of 1904. Molly doesn't entirely trust the offer. Hannan - an ambitious man - has his eye on a Senate seat and intentions of taking Tammany Hall to get it. When Hannan is found dead at the base of the cliffs that overlook the Atlantic, Molly's suspicions are quickly justified, and as much as she wants to keep her promise to Daniel that she won't do any more sleuthing now, there isn't much she can do once the chase is on. 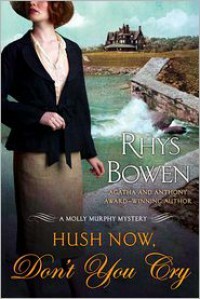 Rhys Bowen's brilliant wit and charm are on full display in Hush Now, Don't You Cry, another outstanding addition to her Agatha Award - and Anthony Award-winning historical series. -Minotaur Books, 2012. I got through this book fairly quickly because it sucked me in so well. I found this book, like all of them, for the most part, at Barnes & Noble. Besides the obvious fact that I love mysteries, it was the connection to Newport that made me pick up the book. I knew I was taking a chance since it was part of a series, but I think it was a risk well taken. As always, spoilers are being kept to the minimum. When I jump into a series that has already been deeply established like this one, I always tend to judge how well the book stands on its own based on the amount of references to previous mysteries. If I don't get that many, to me, it means it's a good series because I think it's lazy writing when a writer continuously refers back to previous mysteries or events in previous novels. If you must do so, do so in a way that makes sense. If you're not, it's just filler and you're aware that you're lacking something in your story. Bowen does not have filler in this book. She makes the odd reference here and there, but there are no pages devoted to previous events. This allows for the book to stand on its own if someone didn't want to read any of the previous mysteries. As the summary says, Molly and her husband go to Newport to celebrate their honeymoon, but find themselves at the site of a murder. When her husband is incapacitated, Molly sneaks around her promise to stop solving mysteries so that she can solve the crime. Molly reminds me a spunky, grown-up Nancy Drew. Her husband is Ned and her two society friends are Bess and George. Making that connection, even if it wasn't intended, warmed me to Molly and the other characters. With the high society thread involved, it also gave me a sense of a Miss Marple mystery with the relationship Molly has to the other characters. The novel itself was very episodic in nature, which isn't a bad thing. It enticed me to read both previous and future novels of the series. Bowen wrote the setting very well - even though I've been to Newport numerous times, I still could visualize the scenery based on Bowen's descriptions. The mystery itself wasn't bad and since the book was only 306 pages, it resolved itself fairly quickly. The solution took me a bit by surprise, but I enjoyed it. I liked all of the twists and sleights of hand that Bowen plays to keep you on your toes. The only fault I would say that there is in the story itself is how Molly gets the killer to confess. It seemed very choppy and not well put together. The idea too was a little out there for me. I'm surprised the killer confessed at all, really. This doesn't take away too many points though, since the rest of it was still very well done and I enjoyed every moment. I look forward to reading the other books in the series. I give Hush Now, Don't You Cry an A. Please support the author by buying the book or by borrowing it from a friend or your local library. Thanks for reading!